What is the central focal point of a church? What is its heart and centre? Some are likely expecting to hear "the tabernacle," and no doubt that is what many might instinctively jump to given its particular importance in popular piety and private devotion. In fact to say otherwise one might even be suspected of heterodoxy and a suspect belief in transubstantiation. But despite all of that, the fact is that the central focal point of the church is not the tabernacle; it is actually the altar. To understand why this is, one has to consider that the Mass is a re-presentation of the sacrifice of the Cross. This is accomplished through the Eucharistic Sacrifice. The tabernacle contains the reserved Eucharistic species, but it is upon the altar that the Eucharistic species are confected and it is there that the Eucharistic Sacrifice is accomplished. Put another way, the Mass doesn't exist simply to fill the tabernacle for private devotion -- though that is certainly a secondary benefit. Rather it exists to offer, in perpetuity, the Sacrifice of Christ to God the Father. So then, to speak of the centrality of the altar is precisely not to denigrate the Real Presence, but actually to point to it in relation to the Sacrifice of the Cross -- that great salvific act. Indeed, Christ could have simply effected the Last Supper and given us the Eucharistic species without the Cross, but it was the Sacrifice of the Cross that was the necessary salvific act and the Last Supper and Mass cannot be properly understood except in relation to it. 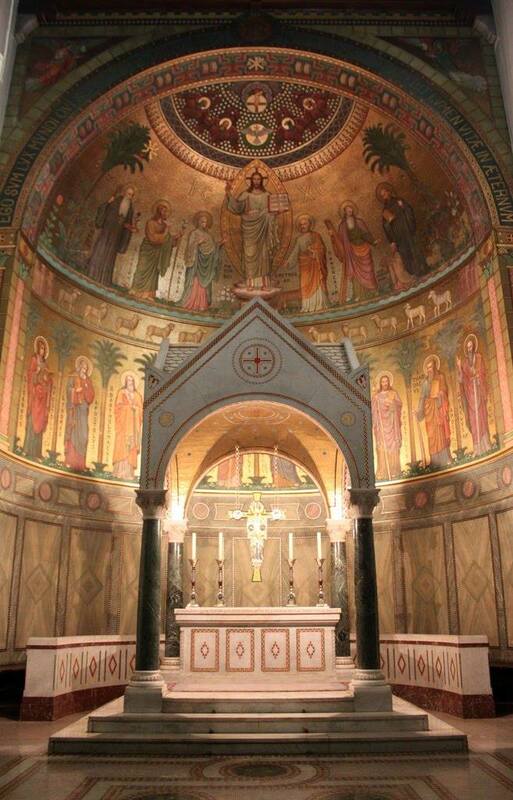 It is for reasons such as these that the Church teaches the altar is the centre of the church. 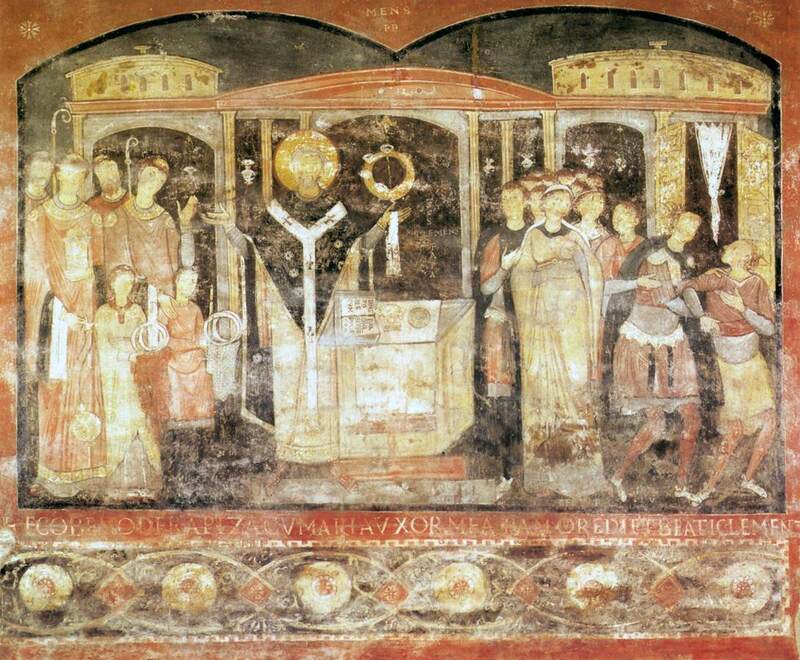 In the ancient church, ciboria often included curtains which would be drawn closed for that most sacred moment of the sacred liturgy, the Canon of the Mass. They also tended to have, amongst other ornaments, oil lamps suspended from them. This can be seen in the following two frescoes found in the lower basilica of San Clemente in Rome. 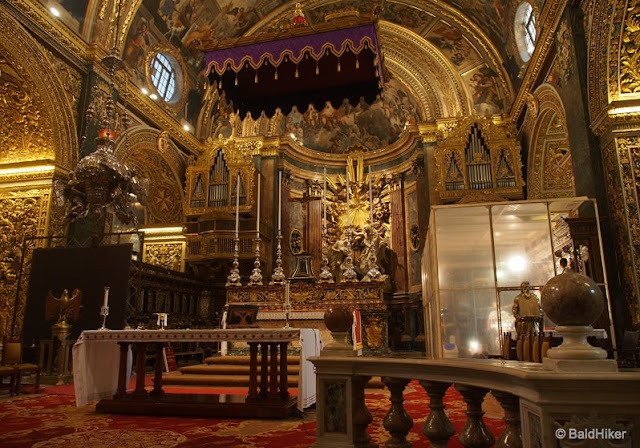 "The ciborium represents here the place where Christ was crucified; for the place where he was buried was nearby and raised on a base. It is placed in the church in order to represent concisely the crucifixion, burial, and resurrection of Christ. "It similarly corresponds to the ark of the covenant of the Lord in which, it is written, is His Holy of Holies and His holy place." One can clearly see in St. Germanus' words that very focus on the Mass and the altar as the place that Golgotha is perpetuated. When, in the usus antiquior, the priest stands and prays the prayers at the foot of the altar -- "Introibo ad altare Dei" -- he stands in a mystical way at the foot of the Cross. When he ascends to the altar, he ascends to the Cross itself, acting in persona Christi and offering to God the Father that one, true sacrifice. This is the heart and centre of the Catholic Faith and liturgical worship and it defines -- or at least should define -- the liturgical ordering of our churches. When one thinks of the great churches of Rome and Italy generally, while there are many elements that attract one's eye in these places, filled as they are with masterpieces of Western civilization, it is the ciborium that pinpoints, like a compass of sorts, the most important place in the church and draws our attention there to the altar of sacrifice. The ciborium points to and enshrines that very spot upon which the solemn, liturgical worship of the Church is offered to God the Father, through Christ the Son, in the Holy Spirit. 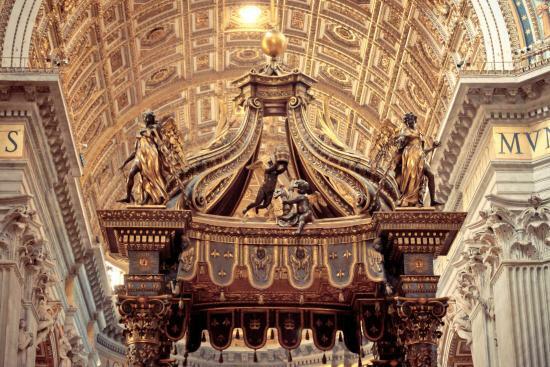 It is akin to the ark of the covenant, as St. Germanus suggests, which covers and surrounds the Holy of Holies; is it the sacred tent. So important was this considered, the Caeremoniale Episcoporum specifically instructed that altars should have a canopy suspended over them. 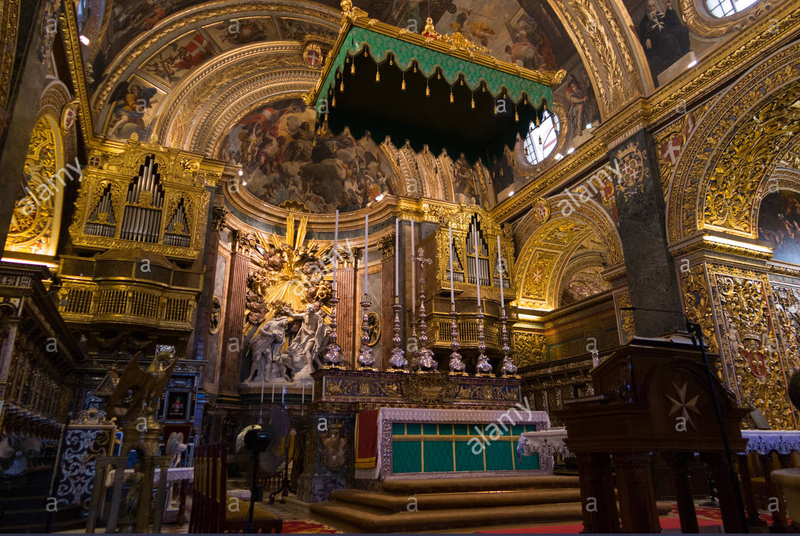 There were, of course, different forms this canopying of the altar took over the centuries, so let us review quickly a few of the main variants. The first is that which is supported by four columns, being typically made of wood, stone or metal. Other altar canopies were textiles on frames of some sort, such as those seen at St. John's Co-Cathedral in Malta. These are, in fact, the origin of the later word "baldachin" which came in reference to the city of Baghdad. It was from there that the precious fabrics were obtained which would be used to make this particular variation on the altar canopy. 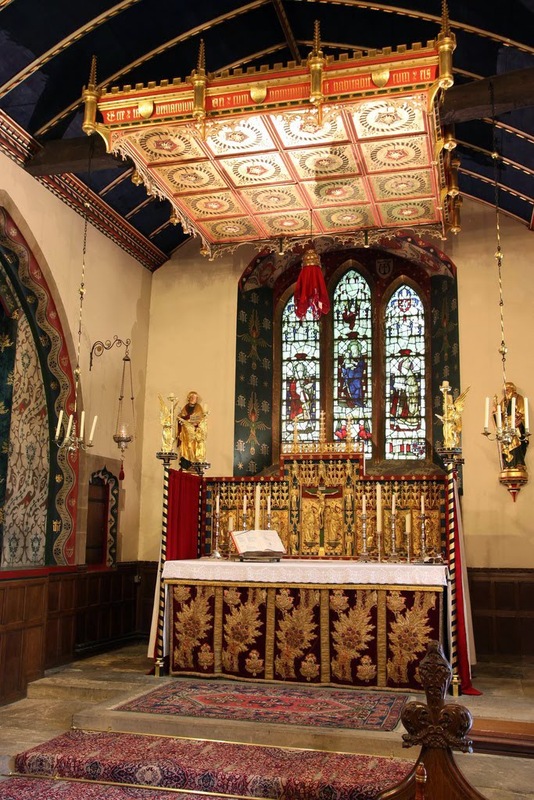 St. John's also has the distinction of being one of those very rare places which follows the purest liturgical guidance around this form of canopy; guidance which recommends that the canopies should follow the colours of the liturgical season. Here are two examples of just that. 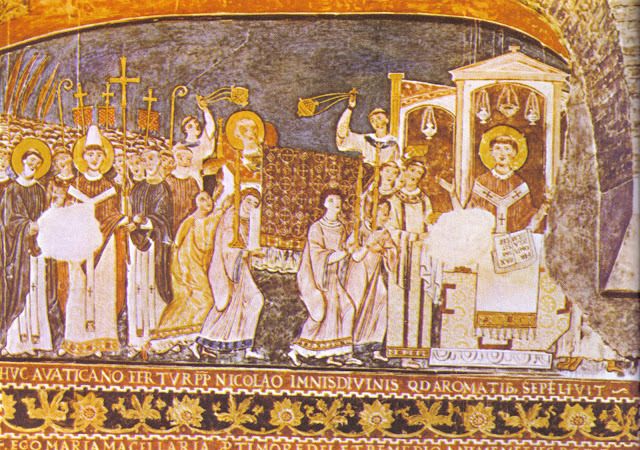 Note the matching canopy and antependium. A violet canopy for the penitential seasons. We will certainly continue to look at further examples in future articles though hopefully this shall serve to provide a quick introduction. The recovery of this long lived and ancient feature of Christian worship and architecture was one of the many worthwhile goals of the Liturgical Movement -- one that should continue to find expression today as new churches are built once again in classical styles. In its forms and in its substantiality, helps to emphasize the importance, substantiality and centrality of the altar within our churches; "the center of the church" on which "the sacrifice of the Cross is made present" (CCC, para. 1182).